Today I found out that Elvis didn’t naturally have black hair. He was born a blond and, when he got older, his hair was more of a sandy blond color. He started occasionally dying it black all the way back when he was in high school and eventually just always kept it as black. 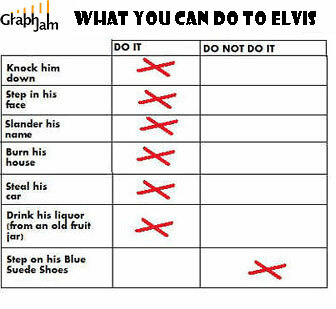 There are an estimated 50,000 people in the world today that make a living as Elvis impersonators. (irony alert) Elvis once wrote a letter to President Nixon asking to become an undercover narcotics cop. Nixon responded by personally giving Elvis a Bureau of Narcotics and Dangerous Drugs badge. During Elvis’s autopsy, doctors found 10 different drugs in Elvis’s blood stream. As a child Elvis’ hair was blonde. As he went through his teenage years it became (first) a “dirty blonde” and (eventually) a light brown. If you watch, as an example, Aloha From Hawaii you will see that Elvis’ hair is a dark brown. Eventhough he died his hair, initially in response to knowing it enhanced his appearance in the movies, his hair color (combined with the dyes)changed through the years as did his eye color (his eyes were listed as blue but depending on the room lighting went from a light green to a light brown to a deep blue). Like everything else about Elvis he was…unique. Excellent question by the way. According to his army barber he was blonde. The guy in Ray Barracks in Friedberg, Germany had a little shrine to Elvis, for years, untill they closed the kaserne. He had some of his hair. My father was stationed in Bamberg, Germany while Elvis was in Munich in the mid-1950s. I was born there. My father’s friend, “Curly” was in the same unit as Elvis. He had dirty blond hair through his late teens, but was dying it even then. Chicks dug the look. Lots of guys dyed their hair jet black during the fifties and sixties, with boot polish. My own father’s hair was brown and I thought it was jet black until I was a teenager. I was very surprised by this ‘outlandish’ revelation.